Well, if you read the two previous articles I wrote on ice fishing rods and ice fishing reels then you know I’m all about saving you money. 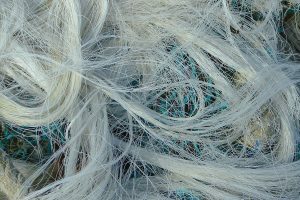 However, this article is all about the ice fishing line and why this is the time to splurge a bit. Twenty years ago, when I first started getting into ice fishing, I really had no idea what to use for fishing line on the ice. I just figured, “water is water!”, so I used leftover mono-filament line I had from summer. Yes, it worked “OK”, but I didn’t know anything else. I’m pretty sure this was before the new Firelines, the braided lines, Teflon lines, etc. Even FIVE years ago, I was buying (or simply using) the braided lines I was using during the summer. My leftover summer lines always seemed to end up on my ice fishing reels. THIS year, however, I stumbled on something remarkable and I was just floored. I chose some expensive “ICE fishing line”. I had just purchased some inexpensive ice fishing combos, and they don’t come with any line, so I figured…why not splurge on some line? I did, and I’m grateful. This line (I’ve forgotten the brand, but I don’t think it really matters) had this slick almost ‘wax-like coating’ on the line. It was, for the lack of a better word, “slick”. I was a bit puzzled because I had never seen this before. It was just so cool. It was ‘limp’, and didn’t have a memory like the old mono-filament line has. It wasn’t stiff, it just plain worked. It would just slide through the guides on it’s way down to the bottom. It didn’t pop off my reel like a twisted slinky and get all tangled…it just WORKED. It doesn’t matter to me how long it will last, I just adore this line. It is just the best type of line I’ve ever used when I’ve been ice fishing. 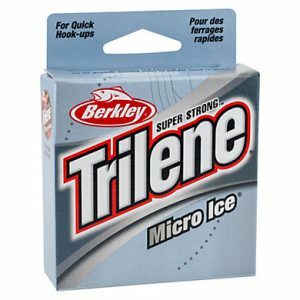 How much ice fishing line should I buy? The typical ice fisherman is going to be fishing in anywhere from 3 to 36 feet of water. Lets call it 1-12 YARDS of water for the sake of the math. On a typical trip, how many times are you going to ‘break off’ and have to retie any specific line? Once? Maybe twice? That’s about 2 yards per trip, you ‘lose’ to unforeseen conditions, or to those toothy northern pike. Ice fishing line is often sold in 50 to 110 yard spools. This means a 50 yard spool can be used on two reels. That’s 25 yards each. Just start spooling with your leftover braided line you used in the summer, then finish it off (with a GOOD knot!) with 25 yards of some decent ice fishing line. Three spools of 110 yards will allow you to spool up 6 ice fishing rods. How is THAT for saving money and still using premium line? What type of strength of line should I buy? Well, this question is a question for the ages, isn’t it? I mean, why not buy 100 lb. 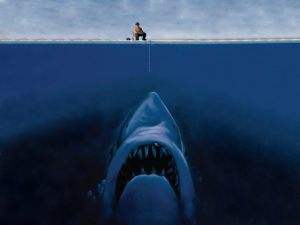 test line, and then you know you will never lose that shark you caught below the ice! But that rarely happens, if ever. Why ‘four pounds’? I don’t know. You were looking for an answer, and you had my collar, and my beer was getting warm. But I DO like the 4 lb. test line. It seems to go down into the hole a bit faster than 6 or 8 lb. test line. It is smaller, so the fish won’t see it as much. And personally? I’ve never lost a fish, while ice fishing, to a line that was too weak. I have lost big fish to stupidity on my part, but not to the line breaking under the weight of the fish. Now you are ticked off at your reel…and isn’t the reel’s fault! It is because your line is getting snagged on the existing line in your reel because you pulled so hard on your line to get it to break. This has happened to me and this is why I like the lower test strength. After all I spoke about using a smaller diameter line when ice fishing with a rod, tip-ups are a different story. A tip-up is usually used around the perimeter of your area to catch the predator fish that scare off the game fish you are targeting. 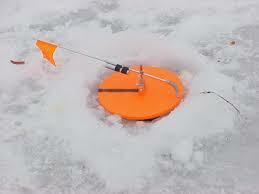 In the Midwest, where you usually target Northern Pike, you will likely suspend the bait about 4 feet under the ice. I suggest a really nice steel leader, and some REALLY strong line. They actually sell ‘tip-up’ line, and it is strong. You don’t need to worry about getting the line buried into the existing line on the reel because you pull up the line with your hands, in gloves. Oh yes, you don’t want the pike taking a run under the ice with that line in your bare hands, that is emergency room material. Use heavy, strong line for tip-ups. The fish don’t care, and you shouldn’t either.